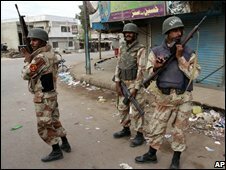 The main parties in the Pakistani city of Karachi have appealed for calm following clashes at the weekend that killed at least 22 people. Their appeal comes after members of the Awami National Party (ANP) fought street battles with members of the Muttahida Quami Movement (MQM). The ANP mostly represents Pashtun migrants from Afghanistan, while the MQM represents Urdu-speaking people. At least 70 people were injured in the clashes, with tensions still high. The BBC's M Ilyas Khan says that much of the violence was spontaneous and many of those who died were bystanders caught in the crossfire of the two feuding groups. 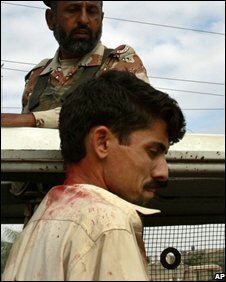 The MQM - mostly made up Urdu-speaking Muslim migrants whose families came to Pakistan shortly after the partition of India - allege that the ANP is trying to "Talebanise" Karachi and its surrounding areas. MQM supporters have been accused of threatening Pashtun shopkeepers and stallholders to vacate certain parts of the city. Our correspondent says that tension increased over the weekend when ANP supporters shut down most of the overland entry and exit points to Karachi, which they control. The party's bedrock support comes from Afghan refugees who came to Pakistan over the past few years to escape ongoing violence in Afghanistan. The three main parties - the MQM, the ANP and the Pakistan People's Party of President Asif Ali Zardari - all joined together in a bid to lower tension. Our correspondent says that their call for the most part seemed to be heeded in Karachi, but sporadic firing still continues in the northern suburb of Orangi Town.